Sergeant First Class Jorge A. Otero Barreto (Ret. ), a.k.a. "the Puerto Rican Rambo" (born 7 April 1937), earned 38 military decorations and has been called the most decorated U.S. soldier of the Vietnam War. Due to his multiple awards he has received recognition from numerous organizations and has had buildings named after him. He is also the main subject of Brave Lords, a documentary which tellsthe story of the Puerto Rican experience in the war in Vietnam. Otero Barreto was born in the town of Vega Baja, Puerto Rico, the son of Eloy Otero-Bruno and Crispina Barreto-Torres. His father named him "Jorge", Spanish for George, after George Washington whom Otero-Bruno admired. In Vega Baja, Otero Barreto received his primary and secondary education. He attended college for three years, studying biology until 1959 when he joined the U.S. Army. After his basic training, he attended the Army's Air Assault School, graduating in 1960. He was the first Puerto Rican to graduate from the U.S. Army Air Assault School. From 1961 to 1970, Otero Barreto served five tours in Southeast Asia, starting as an advisor who helped train Vietnamese troops. According to the documentary "Brave Lords", Otero Barreto served in various military units during his military career. He served in the 101st Airborne Division and the 25th Infantry Division "Tropic Lightning". He also served in the 82nd Airborne Division, an active airborne infantry division of the United States Army specializing in parachute landing operations and in the 173rd Airborne Brigade Combat Team. He participated in 200 combat missions, was wounded five times in combat, and was awarded 38 military decorations, making him "the most decorated soldier of the Vietnam War." Among his many decorations are 3 Silver Stars, 5 Bronze Stars with Valor, 4 Army Commendation Medals, 5 Purple Hearts and 5 Air Medals (one each for every 5th mission which involved a helicopter). 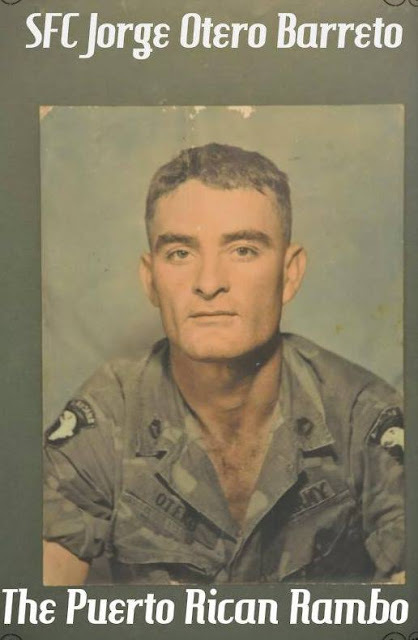 Otero Barreto has been called "the most decorated Puerto Rican veteran,"and the news media and various organizations have called him "the most decorated soldier in the Vietnam War." Whatever the case, Otero Barreto remains one of the most decorated Vietnam War veterans, and possibly the most decorated U.S. soldier in the Vietnam War living today. On 22 June 2012, Otero Barreto was the keynote speaker at a Vietnam Veterans Memorial Dinner in Lorain, Ohio. On 1 September 2006, the Coalición Nacional Puertorriqueña (National Puerto Rican Coalition) honored Otero Barreto with a "Lifetime Achievement Award" in a Conference held at the Hotel Hilton of Chicago. The keynote speaker was U.S. Congressman Luis Gutierrez. A transitional home for veterans in Springfield, Massachusetts, the SFC Jorge Otero-Barreto Homeless Veterans Transitional Home, was also named after Otero Barreto. The home is managed by the Vietnam Veterans of America Chapter #866 in Springfield, Massachusetts. The home is part of a program named named the "Jorge Otero Barreto Homeless Veterans Transitional Program" which houses twelve veterans. The program offers counseling, DVA services from the Western Massachusetts Bilingual Veterans Outreach Center, assistance in obtaining Chapter 115 financial assistance, AA/NA meetings, and Christian Rehabilitation Substance Abuse meetings. The town of Vega Baja dedicated its military museum to Otero Barreto and named it the "Jorge Otero Barreto Museum." On 2 October 2011, Otero Barreto was named Vegabajeño del Año en Civismo (Civic Citizen of Year of Vega Baja). Otero Barreto was featured in the documentary film Brave Lords, a perspective on the war in Vietnam, as experienced by Puerto Rican soldiers.